Heavy breathing in cattle is most commonly a sign of illness or disease. On a hot day, cattle normally breathe heavier and pant, so you should look for other signs of abnormal symptoms. Heavy breathing may be audible and the animal may struggle to draw air into the lungs and have trouble forcing the air out of the lungs. Causes of heavy breathing in cattle include bacterial, viral and respiratory diseases and illnesses. Thromboembolic meningoencephalitis (TEME) is an infectious cattle disease caused by bacteria attacking the respiratory tract. A lowered immune system allows the bacteria to multiply and enter the bloodstream, resulting in septicemia. When the bacteria enter the lungs, rapid breathing and coughing may develop and progress into pneumonia and breathing difficulties. Clots may lodge in the larynx, constrict breathing by swelling the airway and cause loud, difficult breathing. A herpes virus called infectious bovine rhinotracheitis (IBR), more commonly referred to as red nose, infects the upper respiratory tract of cattle. When combined with a bacterial infection, pneumonia may develop and cause breathing difficulties. Respiratory syncytial virus (BRSV) damages the cilia of the windpipe by trapping air in the tissues of the lungs. Raspy, labored breathing or breathing with the mouth open can occur when cattle are infected with this virus. Respiratory infections in cattle can be minor or severe depending on the pathogen and the level of damage to the respiratory system. Respiratory diseases have a tendency to be more life threatening than infections. Diphtheria causes an infection in the mouth and throat, which results in swelling, restricted airways and breathing difficulties. Infectious lung disease or pneumonia occurs from an infection in the lower respiratory tract which affects the lungs and causes noisy and difficulty breathing. Bovine respiratory disease, more commonly called shipping fever, is a form of pneumonia caused by a number of pathogens that infect the lungs to cause heavy breathing. Emphysema or atypical interstitial pneumonia (AIP), also called fog fever, acute bovine pulmonary edema, bovine asthma or lung fever, occurs with a sudden change in the quality of feed. A toxic reaction in the lungs results in the bronchial passages constricting and the lungs rapidly filling with fluid. Severe respiratory distress causes labored breathing problems, grunting or wheezing and breathing through the mouth. 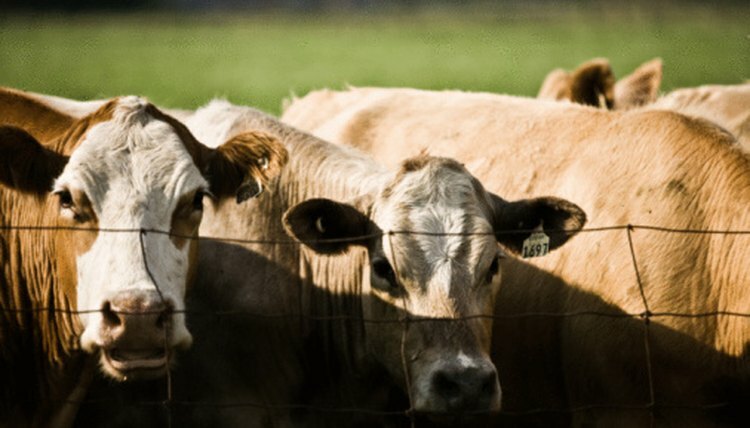 Cattle can have a severe allergic reaction to an injection called anaphylaxis. Heavy breathing and wheezing occurs when the throat and voice box become swollen and the lungs fill with fluid. This allergic reaction can cause cattle to extend the head and neck and pant with an open mouth. Toxic plants and weeds can injure or poison cattle if ingested. Poisonous weeds that cause heavy breathing in cattle when eaten include bracken fern, marsh arrow-grass, marsh marigold, wild cherries, lupine, milkweed, cockle, white snakeroot, cocklebur, sneezeweed, squirrel corn and chokecherry.